Another book for my summer reading collection arrived on my doorstep this morning! 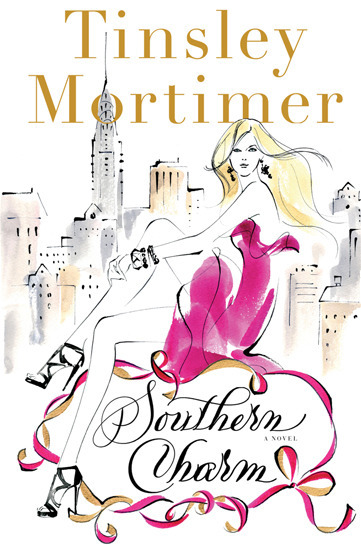 Southern Charm by Tinsley Mortimer. When I read the overview and reviews for this book on Amazon, I knew I had to read it. This novel focuses on Minty, a Charleston, SC native who makes the move to the Big Apple. We follow Minty through many setbacks in NYC as she adjusts to a whole new environment where southern hospitality and sweet tea are nonexistent. Even though I live in Chicago, I love all things southern so I knew I would LOVE this novel. Here's the book description from Amazon: Southern girl Minty Davenport has always dreamed of skyscrapers, yellow cabs, and a life like Eloise’s in New York City. So upon graduation from college, she bids adieu to Charleston and makes a beeline for the Big Apple. Almost instantly, she finds herself at an event being photographed for Women’s Wear Daily, and her career as a New York society “It Girl” is launched. As Minty navigates the ironclad customs of New York society, a blossoming love life, and a job working for a ruthless and powerful publicist, she finds that the rules a southern belle lives by—being nice to everyone, accentuating her femininity, and minding her manners—don’t necessarily guarantee success in Manhattan. She may indeed be accumulating new friends and opportunities along with boldfaced mentions and a very eligible bachelor boyfriend, but someone is plotting her very public downfall. When Minty gets to the top of the social ladder, she must decide if the glamorous life she thought she wanted is really everything she hoped it would be. Tinsley Mortimer’s insider observations about New York’s elite are deliciously witty, and the heart of her book is that of an irresistibly lovable young woman who is on the brink of finding her dream. I pre-ordered this book and FINALLY got around to reading it! Love it!